Oklahoma faces a health crisis – 17% of the state population is uninsured. In Oklahoma County, 23% or almost 1 in 4 persons is uninsured. * The majority of these individuals are 19-64 years of age and are working, but their employment does not include health insurance. Being uninsured is a huge barrier to accessing the health services needed to be healthy. Lack of access to quality healthcare impacts more than the uninsured individual – it impacts families, employers, and the community. The Board initiated the R. Murali Krishna, M.D. 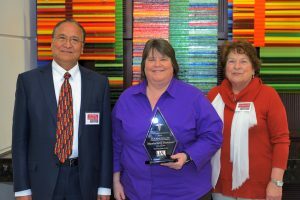 Award for Community Service in collaboration with the OU College of Medicine. 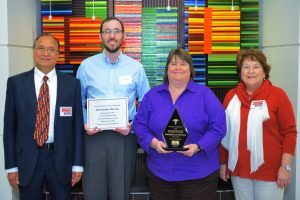 The Health Alliance for the Uninsured presents the award during the Bridges to Access conference, an event coordinated by the OU Community Health Alliance. Students, faculty and safety net clinic personnel nominate fourth year medical students that exemplify tremendous compassion, dedication and skills. All students nominated for the award receive a framed certificate. Health Alliance for the Uninsured now has a profile on GiveSmartOKC. GiveSmartOKC is a powerful gateway to comprehensive information about charitable organizations in central Oklahoma. GiveSmartOKC is administered by the Oklahoma City Community Foundation and is powered by GuideStar. In each profile, you will find vital facts about nonprofit organizations that can help you make decisions about where to volunteer your time, make a gift or learn more about community issues. Click the button below to view HAU’s profile. Now you can help support HAU when you shop online at Amazon! AmazonSmile is a website operated by Amazon that lets customers enjoy the same wide selection of products, low prices, and convenient shopping features as on Amazon.com. The difference is that when customers shop on AmazonSmile, the AmazonSmile Foundation will donate 0.5% of the price of eligible purchases to the charitable organizations selected by customers. Click here to shop at Amazon Smile now! The Health Alliance for the Uninsured is to be a highly effective community organization that facilitates quality preventive and health care services to the medically underserved of Central Oklahoma.